Annual conference sheds light on the riots that took the lives of 67 civilians. 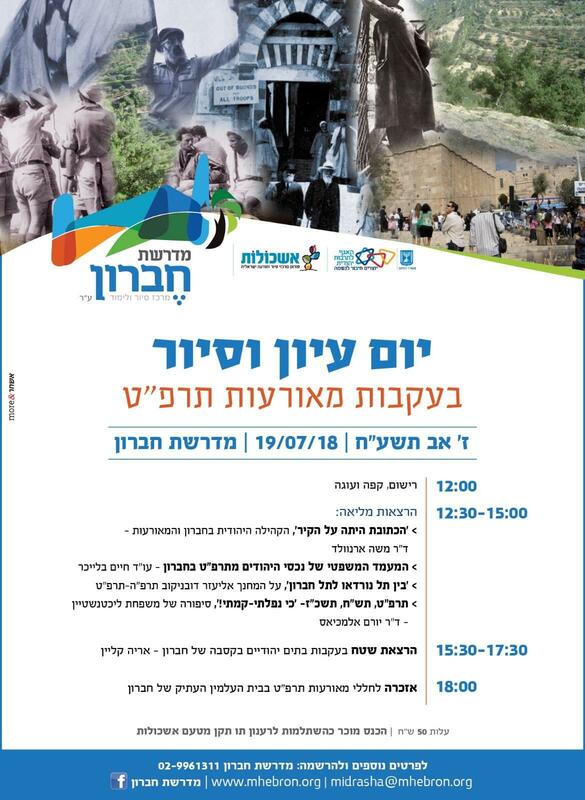 The annual conference and memorial for the 1929 Hebron Massacre will take place on July 19, 2018. Known in Hebrew as TARPAT, an acronym for the Hebrew date corresponding to 1929, the riots resulted in the expulsion of the Jewish community. The annual conference is sponsored by Midreshet Hevron. * Dr. Moshe Arnwald: The writing on the wall: Hebron and the Events of 1929. In this lecture, we will try to understand the background to the outbreak of riots in Hebron. Was there any prior knowledge of the Arab intentions? * Attorney Haim Bleicher, The Association of Jewish Community Innovators in Hebron - Review, Locating and Ownership of Jewish Property in Hebron and Their Legal Status. For the first time, a comprehensive survey of the assets of Jews in Hebron since the riots and their legal status will be presented. * Colonel (Reserve) and former Deputy Minister of Education Moshe Peled, of Beit Hashita - Between Tel Nordau and Tel Hebron. A lecture on the educator Eliezer Dubnikov (also spelled Dobnikov). A fascinating personal testimony about the family of Chaim Eliezer and Chana Dubnikov, who arrived in Hebron on that terrible weekend with their two children and were brutally murdered. The first members of the Dubnikov family will take part in the lecture, which will come especially from around Israel and abroad. * Dr. Yoram Almakias of Orot Israel College and Midreshet Hevron, and Col. David Shapira (nee Lichtenstein), Etzion Commander-in-Chief - "I Fell, but I Arose" - The Story of the Lichtenstein family. The death of his grandfather Ze'ev Elimelech Lichtenstein in Hebron -- the death of his two grandsons Yaakov and Avner during the War of Independence in 1949 -- the closure of the circle of the third grandson, Eli Avner, who was the commander of the Jerusalem brigade that liberated Hebron In the Six-Day War, and later as deputy governor of Hebron and his tragic death a few months later. The family has wide circles in Hebron and Jerusalem, and its representatives will come and share with us at the seminar and at the memorial in the cemetery. Memorial service and kaddish at the ancient Jewish cemetery in Hebron. For more information call 02-996-1311.